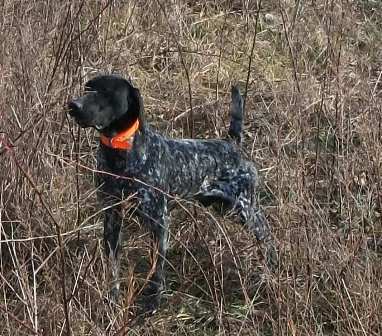 Southern Missouri Shorthairs - Feb. Puppies - whelped 2-18-17 Dam: Ward's Ozarks HiediSire: CRK's Copper All puppies have been placed with new families. All puppies have been placed with new families. Dam’s pedigree includes National Field Champion Heide's Mighty City Slicker, National Field Champion Rawhides Clown, DualChampion Hill Haven Hustler, Field Champions Bluemax Spitfire V Grief and Sieg Heil, and Champions Stradivarius Maximilien and Majority Speaker of the House, National Field Champion Rawhides Clown, Dual Champions /AFC Shill Rest's Impressive and Cajun Queen, Dual Champion The Flying Dutchman V Rip Traf, Field Champion/American FieldChampion Koyote White-Mountain Mist, Field Champions Dolly's Big Is Junker V Greif, Rawhides Lucky Moon, Rockin Rollin Billy.